HALOTRON I is a “Clean Agent” Hydro Chlorofluorocarbon discharged as a rapidly evaporating liquid which leaves no residue. It effectively extinguishes Class A and B fires by cooling and smothering and it will not conduct electricity back to the operator. Halotron is pressurized with Argon gas and is an EPA and FAA approved HCFC blend B agent approved for use on Class A, B and C fires. It has a low Atmospheric Lifetime (3½ to 11 years). 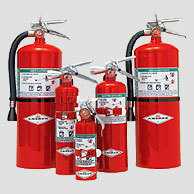 Halotron is intended for use in areas formerly protected by Halon 1211 hand portable extinguishers such as computer rooms, telecommunications facilities, clean rooms, data storage areas, offices (for protection of sensitive electronic equipment), boats and vehicles.